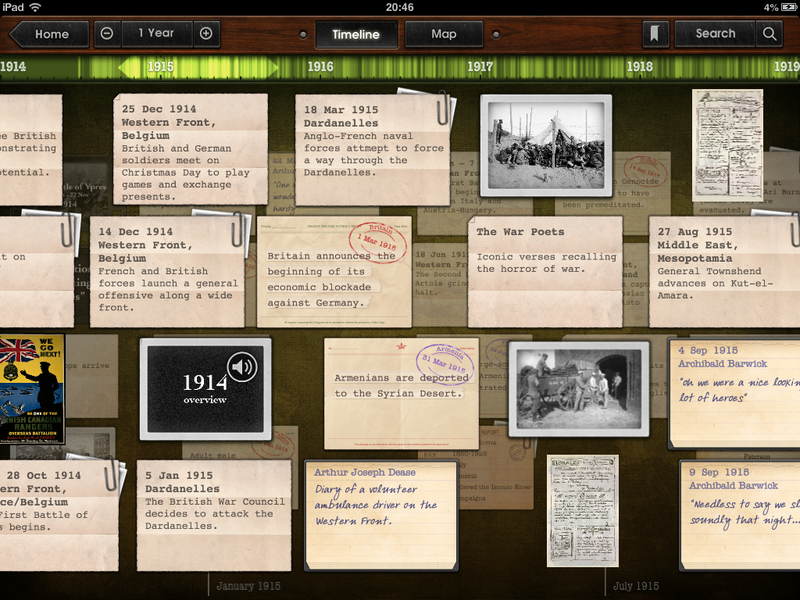 Timeline WW1 follows the success of its big brother Timeline WW2 to bring a high quality First World War interactive timeline to the ipad. The ubiquitous Dan Snow reprises his role, bringing his enthusiastic style to the voiceover commentary and analysis about various aspects of the war. Visually the app looks very highly polished. It can be viewed in timeline or map view, with various types of content available to view along the timeline. 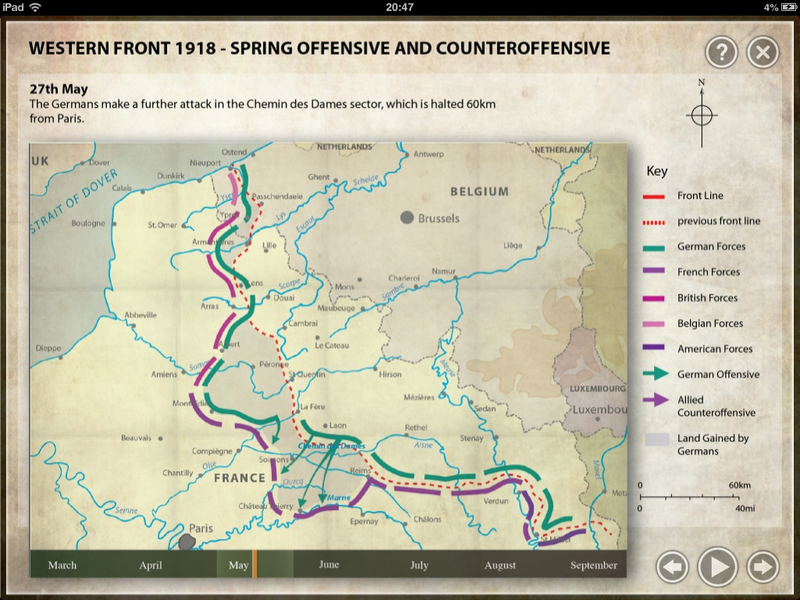 Helpfully the time span can be adjusted to toggle the amount of detail and content presented on the screen – from the period of the entire war right down to daily entries. Using the map view countries can be selected to view their involvement in the war. 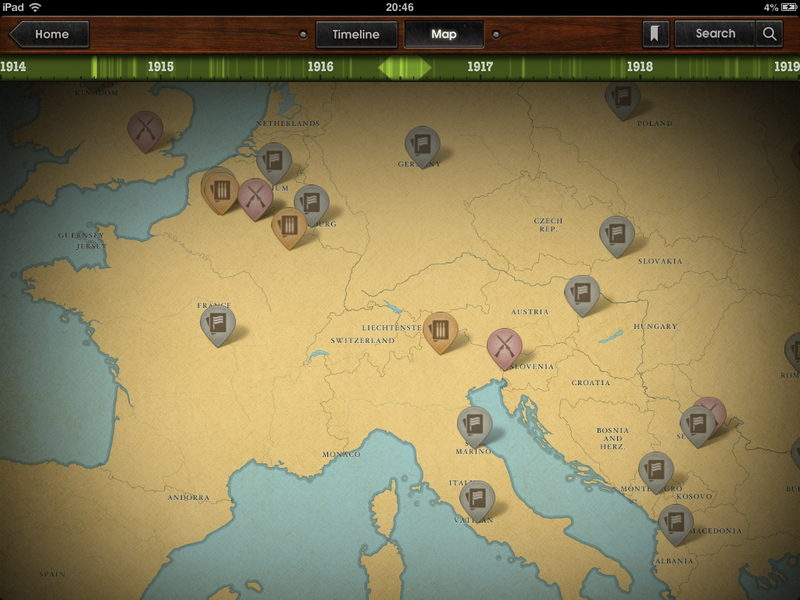 As the timeline scale moves markers appear representing the campaigns and battles that occurred at that time. Selecting links in the content switches between the relevant entries on the map and the timeline. Once you figure out navigating between the various screens the app is fairly intuitive to use; if you get stuck there is an overall ‘help’ section plus help within the various screens of the app content itself. Boasting over 500 pictures, 100 videos and 1000 entries, the sheer amount of content is impressive, ranging from letters, poems (in a nice touch read by serving soldiers) and pathe films, to propaganda posters, ‘personnel files’ of some of the key players, and animated campaign maps. A search function can be used to search by type of content (e.g. images, film, or audio), by event, country, or keyword, and content can be bookmarked for quick access. In fact it seems that every aspect of the app has been given careful consideration; the app’s home screen even has an ‘On this day’ feature which can be selected to jump straight to the respective entry. With its polished presentation, user-friendly controls and content in abundance it is difficult to find anything to criticise. There are currently no immediate plans to adapt the app for iphone or android platforms, but the app does benefit from the larger screen size of the ipad. The high production values do come at a cost and to access the full version of Timeline WW1 will set you back £6.99; at the higher end of the price spectrum but excellent value given the longevity of interest that it offers.